The web hosting industry is a very crowded place filled making it complicated for users to choose the right hosting. Moreover, if you are a developer looking for good cheap cloud hosting you have to consider a few things else you might end up with a cloud hosting that’s crap. Bottom line you are here to find affordable cloud hosting that offers low cost but also delivers maximum uptime powered by reliable sustainable servers. In this article I am not going to talk about shared web hosting rather cloud hosting (more on this later) so if you are a blogger I recommend the former however if you are a developer or experienced webmaster who can’t afford to have long loading time, downtimes etc keep reading because I will be explaining about some of the best cheap cloud hosting services to get in 2019. All of them are trusted and used by top class companies and wouldn’t be on my list if I didn’t trust them. What is Cloud Hosting and why should I get it? Cloud hosting is simply a network of servers that are strategically located around the world that concurrently store user’s data. Although it is shared with other users it renders extremely high speed that can beat any other traditional shared hosting as it is powered by some of the finest CPUs and Ram. The real icing on the cake is the strategically located network of servers that give you 100% uptime at all times as if one server goes down, faces technical issues and traffic spikes the other servers that are connected in parallel cover the outage! This is why many professional webmasters prefer cloud hosting over shared hosting basically it’s cheaper than dedicated hosting and much faster than shared hosting which is a perfect balance as now you don’t have to break the bank to get your hands on a really fast and reliable server. What to look for in a good Cloud Hosting provider? A server is a foundation that brings your web application to life so it’s evident that it needs to reliable and good enough to host it effectively. Choosing a bad cloud hosting provider can, in fact, kill your business as your web application will experience long loading times and downtime negatively affecting SEO and ultimately sales. Before you even begin to pick a good cloud hosting provider you need to first determine your specific business needs and whether it is the right time to upgrade or get Cloud hosting. A lot of people fail to understand their businesses needs and end up getting a cloud hosting that’s not right for them so clarity on your businesses requirements is the first step towards picking the right cloud hosting for you. Good cloud hosting providers comply with strict certifications because they invest in best practices and keep their standards high and while standards may not determine which service provider is good for you it depicts the quality of the hosting provider. We live in a digital age where customers want everything instantly and definitely do not want to wait for your website to load or worse access an inaccessible website because then they’ll just switch to your competitor. I always look for 99.99% uptime guarantee and also pro-rata credit just in case I do not get the promised guarantee. And of course, a server with SSD storage to ensure fast performance especially because HDD backed servers experience long loading times. It is important to think about how the architecture will be incorporated into your workflow now and in the future. For example, say your business is invested in the Microsoft universe it makes sense to move forward with Azure however if your organization is more Amazon/Google it’s best to look at those vendors for ease of integration. Note: Cloudways is well integrated with many third-party providers making is quite versatile to choose to pick something. Now, this is a tough one as investing in good tech support is expensive and not many “cheap” cloud hosting plans can really afford to price their services down and invest in expensive support. However, some cloud hosting provides live chat and call options and it’s worth going for these provides although they may be a little bit more expensive. So yeah that’s pretty much all the factors you need to consider whilst deciding to get good cloud hosting. So, here is my list of recommendations for the best cloud hosting services as of 2019. Only those services that are low cost and have reliable services have made this list so you can rest assured you will find your pick among these recommendations. Overview: With plans starting at $2.5 per month Vultr is among the cheapest cloud hosting providers on the market moreover they offer premium features like virtual cloud computing, block storage, dedicated instances making it a no-brainer pick for another looking for good cloud hosting that won’t break the bank. Support is average with no option for live chat however the ticket based system is pretty fast. Why Should I get Vultr? With pricing at $2.50 per mo, Vultr is one of the cheapest cloud hosting providers in the market. Moreover, it offers premium features that make it an absolute no-brainer to invest in. Overview: Cloudways is a managed cheap cloud hosting provider that starts at $10 per month and is great a multitude of applicated related to e-commerce, bloggers, designers etc. They also have a trial option so be sure to check that out here. Add to that a great support system and you’re looking at a really good cheap cloud hosting provider. Great support system via chat, tickets, and documentation. Great infrastructure based on Amazon, Google, Vultr and over 25+ data centers. CloudWays offers performance optimized cloud servers that are powered by some of the best companies like Amazon Web Solutions, Google, Kyup etc. So basically you can buy cloud solutions from various providers through CloudWays which makes it easy to enjoy business-class services without messing with complex setups. Most cloud hosting providers limit the number of application install but with CloudWays you have the option of installing unlimited applications with add-on features like 1 Click free migration and cloning features. People pay a premium for cloud hosting because of their strategically located servers and Host1Plus has servers located all across the globe in South Africa, Germany, Lithuania, Brazil and are trusted by over 64k customers. I love the shared features bundled with all the plans like 1 free backup, Xeon E5 v3 processors, 10GB link speed, DDR4 error correcting-code ram and virtualization technology which is actually sometimes not provided by premium cloud solutions. If you are skeptical and want to just give it a try you can opt in for a 14-day free trial before buying into the annual or monthly plan. This is more than enough time to try out the service and get your money back if you decide to opt out. With data centers in San Francisco, Toronto, New York City, Singapore, Germany, Bangalore etc and an uptime guarantee of 99.99% and you’re looking at a pretty really solid cloud hosting provider. Most cloud hosting providers offer restricted plans at a cheaper price but with Digital Ocean you have that experience of using a full-fledged premium cloud server at a budget price of only $5/mo this is great to gain enough experience to understand how to use the server before you decide to start some serious work. Overview: This cloud hosting provider is best for those that want to scale and have websites with a huge amount of traffic. Moreover, with plans starting as low as $6/mo at 1 TB bandwidth InterServer is a very cost-effective choice. Interserve has several advantages like a 99.9% uptime guarantee, SSD drives and options to choose up to 16 OS. Do note if you want cPanel you have to pay an additional $10. Interserver is also very common amongst developers because of support for multiple languages like PHP, Perl and Python and other salient features like backup, snapshots, DNS manager, IPV6 and more. In conclusion, InterServer isn’t great but it isn’t bad either for the price it’s a pretty decent Cloud hosting option. Overview: Although a little on the expensive end A2 Hosting is still a quite affordable option among SSD cloud hosting providers. Moreover, you have the option to customize your plan as per your requirement to prevent extra charges. Why Should I get A2Hosting? One thing different about A2Hosting is you have a high degree of control over customizing the plan to keep pricing low and paying exactly for what you need. You have control over the selection of Linux operating system, shopping page and you can also select the version of CentOs, Fedora etc. If you are a developer then there is a tailored plan just for you called the “Cloud Disaster Recovery” which is specifically optimized to troubleshoot errors whilst coding and restoring the previous session. Most cloud hosting providers offer a 14-day policy which is still good but with A2 Hosting you have the option of claiming a full refund within 30 days which is more than enough time to know the in and outs of hosting. Overview: This is a big name in the hosting industry and one that offers great cloud hosting as well. In fact, it is one of the top 10 web hosting companies that provide incredibly fast and reliable WordPress optimize cloud storage that’s best suited for bloggers. No site backup for starter and performance plans but only business Pro plan. Why Should I get BlueHost? The Starter plan priced at $6.95 per month lets you host 1 website with 100GB bandwidth, 1 free domain, 2 GB ram, and marketing credits. The business pro plan priced at $15.95 per month offers dedicated IP, SSL certificate, SPam protection, backup and much more. Moreover, you get a domain free for one year with EVERY plan that’s a minimum 15$ saving right there! Overview: An award-winning web hosting service for WordPress websites and other web applications that manages over 1.5 million sites and apps. With plans starting at $4.5 per month bundled with powerful features such as root access, SSD and good network you cannot go wrong with DreamHost. Why Should I get DreamHost? 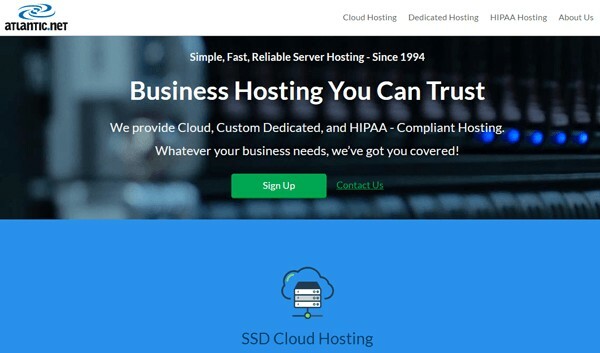 DreamHost although a premium hosting company offers cloud hosting services starting at $4.50 per month with a bunch of powerful features such as SSD storage, globally centered servers and decent hardware like 1 vCPU, 512 MB ram, 100GB storage, and 80GB SSD space. It can be tricky to find the right cloud hosting as there’s a learning curve to really figure out how the server works and this is when you pretty much know if it’s for you. While most hosting providers offer a 14 and 30-day money back guarantee DreamHost offers a whopping 97-day refund guarantee so you can pretty much use it for almost 3 months get the complete experience of a cloud server and claim a refund if you think you didn’t get what they claimed. Overview: SiteGround is known for being one of the best website hosting companies in the industry and also extends its service to cloud hosting. It’s got the best customer support and uses reliable high-end servers that are located across the globe. A little expensive as compared to other hosts but for the features, you get in return it’s worth paying the extra premium. Why Should I get SiteGround? SiteGrounds hosting may be a little bit expensive but this extra cost gets you servers with high-end configurations like Dual CPUs, 4GB Ram, and 40GB SSD space. You also have the option of scaling to add more resources in case you want to scale your web application. SiteGround is popular because it has one of the best support in the industry. It offers multiple channels of communication from telephone to live chat to ticket based system that work round the clock. Overview: Atlantic.net offers a wide range of plans but is not among the cheapest. The company categorizes its plans on resources so as to offer custom configurations that are work just right for its users. Why Should I get Atlantic.net? Although Atlantic.net is a new hosting provider it offers premium quality servers powered by SSD, 6 active data centers and good support. While their plans do not focus on simple website builder or pre-installed programs they offer premium features at competitive prices. So if you’re new to web hosting these plans are probably not the best for you however if you’re looking for scalability and root access then you will definitely be impressed by Atlantic.net offerings. Why Should I get Linode? Linode sticks to the industry standard of premium services by offering a 99.99% uptime guarantee with a pro-rata credit system if your service is down long enough to break the SLA. Moreover, you have the opportunity to host your website in one of the six data centers (Tokyo, London, new jersey etc) with test download options to assess the best option and an option to move later. In short, Linode is an option that’s best for people knowledgeable in Linux as there are no managed options you will have to do a lot of things on your own. However, the competitive prices for the superior hardware you get in return make it an attractive option for many experts. The Bottomline: Which cheap cloud hosting should I get? Cloud Hosting is great for people that can’t afford dedicated hosting but still require something that is reliable and fast. However, cloud hosting can still get expensive and looking for a good one is not exactly easy. You could pick one of the overall balanced recommendations like Vultr or try out some of the recommendations with refund policies to just have a trial of the plan and have that option to refund if you find that cloud hosting is not for you.